You'll be £19.99 closer to your next £10.00 credit when you purchase March of Death. What's this? In the bitter winter of 1808, a small British force found itself outnumbered and out-manouevered by a French army led by Emperor Napoleon. Faced with a crushing defeat, the British, commanded by Sir John Moore, turned and marched through the mountains of northern Spain. Casting away baggage and supplies, the little army retreated through desolate mountain passes before reaching Corunna with the French at their heels. There they turned and fought, before embarking for Britain and safety. However, as in every epic, there was great loss. Sir John Moore, gallant, respected and honourable, fell at the moment of victory. March of Death is the story of a terrible retreat through the eyes of those who were there and survived. Relating the horrific ordeal through excerpts from survivors' diaries, letters, memoirs and reports, this narrative brings to life the heroism and glory of a real fight for survival. 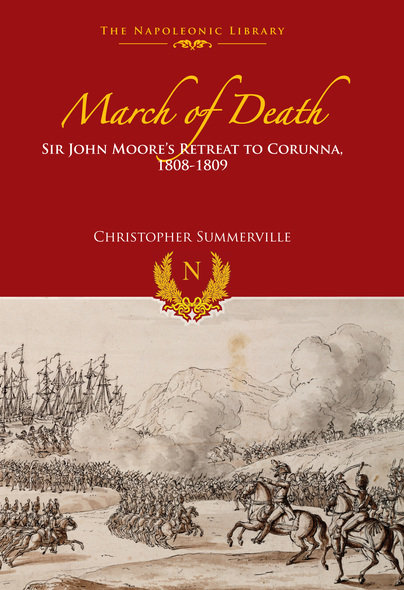 Without doubt, few episodes of British military history have been as dramatic as Sir John Moore's retreat to Corunna. It is a popular history that is very well written and will keep the reader’s interest. I strongly recommend it for those who have not read much on the Peninsula War. It is a great place for further studies! In the bitter winter of 1808, a small British army found itself outnumbered and out manoeuvred by a French army commanded by Marshal Soult. Faced with defeat, the British under Lieutenant General Sir John Moore KB turned and marched through the mountains of northern Spain. Casting away their baggage and supplies, and pursued by the French, the army marched through desolate mountains before reaching Corunna. There they turned and fought on 16th January 1809, before embarking for England and safety. The battle was won, but Sir John Moore was mortally wounded during the action, a great loss of a talented and respected leader. This book, first published in 2003, relates the story of the British retreat through the eyes of those who were there and survived. Drawing on their diaries, letters, memoirs and report, the narrative brings this gruelling and dramatic episode to life. Also included are three maps, 25 illustrations, an epilogue, three appendices, including the British order of battle, a select bibliography and an index. A moving and harrowing narrative of the greatest evacuation of British troops from the continent before Dunkirk, Christopher Summerville has collated together some of the most inciting accounts of the desperate retreat to the sea of those who were present. With accounts written by both the officers and men who were present on the retreat, this collection carefully provides an account of those who fell prey to the retreat’s cruel conditions and the fate that befell those who fell behind with the march. Combining both the tragedy of the retreat and the heroism of the final stand, the author offers a rare insight into the campaign that almost destroyed the British army.